This node gives maximum freedom to compose two terrains. 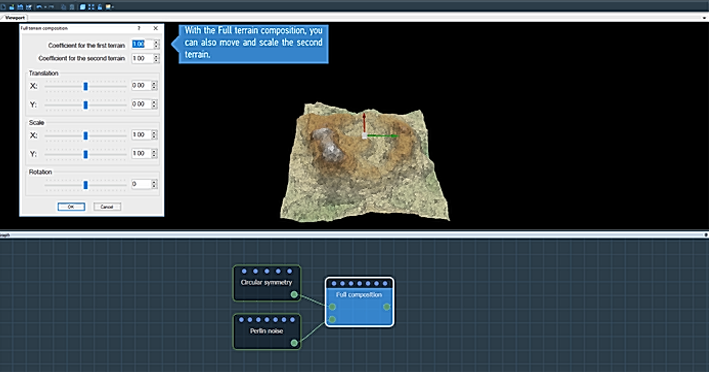 The second terrain can be translated in the X and Y axes, scaled, and rotated before composing it with the first terrain. To add a node, right click in the Graph Editor and select Create Node > Terrain Composition > Full composition. Coefficient for the first terrain: Sets the coefficient by which the height of the first input terrain is multiplied. Coefficient for the second terrain: Sets the coefficient by which the height of the second input terrain is multiplied. 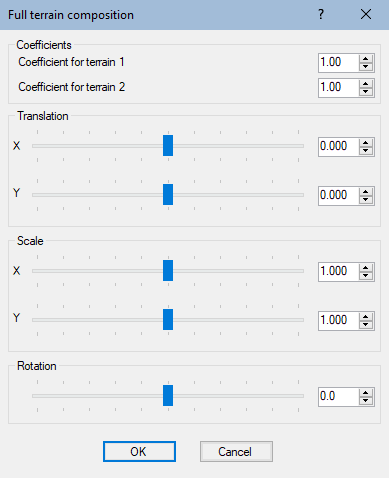 Use the sliders to set the translation, scale, and rotation values or click and drag either the center, the X axis, or the Y axis of the gizmo. Translation: Sets the translation along the X or Y axis applied to the second input terrain before composing it with the first terrain. The translation values are relative to the size of the output terrain. A value of 0 positions the center of the second input terrain at the center of the output terrain. An X value of -1 positions the center of the second terrain on the left edge of the output terrain. 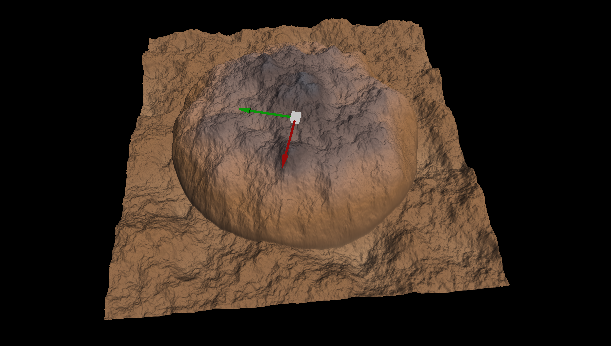 A Y value of 1 positions the center of the second terrain on the right edge of the output terrain. Scale: Sets the X axis or Y axis scale to be applied to the second input terrain before composing it with the first terrain. The default scale value is 1, which means that the second input terrain retains its default size. This is not the case for the Terrain composition node where the second input terrain is automatically scaled so that its size corresponds to that of the output terrain. Rotation: Sets the angle in degrees to rotate the second input terrain around its center before composing it with the first terrain. Right-click on the terrain to change to the rotate gizmo. Drag the mouse when the gizmo is highlighted in yellow to change the angle of rotation.